[Click on Charts to read the fine print] My mama always said that raising kids is just "threats n' bribes, threats n' bribes..." which is a pretty simple philosophy considering all the tomes written on raising children. I've known this, but haven't been applying the "bribe" portion very well. You see, just about every mom I know of is struggling with their kids right now. For me, it was the battle with the 5 yr old over throwing away Sam's stinky diapers. The feelings of guilt that swarmed every confrontation, not to mention his pleas for a play date were just getting to me because I didn't want to add ONE MORE KID to the mess I was dealing with! Then I noticed my sister had a very simple notebook paper "chart" on her fridge. So, I asked her about it. "Allen (her husband) made that. When she's good, she moves forward a space, and when she's naughty, she moves back. Too far back and she'll end up on her bed..."
"What happens if she gets to the end?" "Oh, she gets a package of M&M's..."
So SIMPLE! And a cheap bribe too! It eliminates motherly commentary on behavior, "What is WRONG with YOU TODAY!" and just simply, and emotionlessly, inflicts a consequence. BAM, you moved back a space. Wanna go another? So, I made up a chart for my two kids. Service and being ready on time gets you points, sass & backchat moves you back. I printed it off, got some of those cheapie flat magnets off the fridge and had it all laminated together so it sticks on the fridge. Each kid has their own magnet to move forward and back. YES! We have had two play dates, and the kids are excited now to get a point for any ole thing. 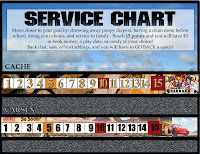 My kids very own chart is probably the crappiest of the three, but I've been happy to switch the template and help others with their chidlren to gain some ground in the serenity department. Great idea! We are currently dealing with Brandon's attitude right now. We give him a dollar each day he makes it through without giving us or his siblings any grief. We've been doing it 2 weeks and he's only earned it twice. I like that you can move back and forth instead of just getting or losing it. Awhile ago I tried coins in a jar - he started with 10 each morning and every time he was bad we took one away and every time he was good we put one back. Whatever was left at the end of the day he got to keep. I like it!! the key to any system is consistency. I am always the problem there. Awesome. I've been mulling a chart now that Victor is almost four. This is a great idea. Love it! I am constantly doing and redoing charts after they lose their appeal...this sounds like a great new one to try and sooo easy. I also like the ability to move back or forth and it resembles a game board so that's another plus. Thanks for your comments on my blog...I love them, they are so hysterical and with all of your *pat pat* and etc type comments, I feel like we've actually almost had a chat in person! So cute! I am all over the bribes. Isn't that what a job is? Show up every day and do your work = pay check. I'm not so hot on the consistency part either. But I really like that it doesn't need to be verbal. Sometimes I feel like I yell at my kids or chastise them all the time. It would be much easier and save a lot of bad air vibes to have something like this. Thanks, now I have something to think about today! Glad to know I'm not the only one ready to throw in the Mother towel! 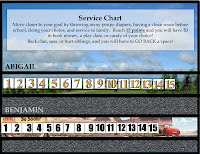 I'm going to try out this chart. you are awesome Cuz! 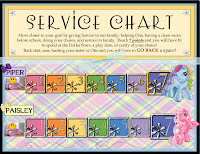 I love our pony chart!! and whenever they get moved back a space, it's like armageddon. NOOOOO MOOOOOM!!! NOT A SPAAACE! and i totally related to the "What is WITH YOU today??" comment.